Best Android Lookout : Samsung Galaxy S III : Wireless Charging Kit Coming Soon! 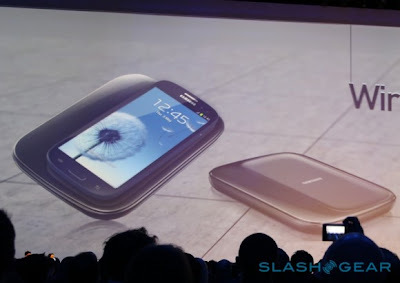 Samsung Galaxy S III : Wireless Charging Kit Coming Soon! "People who are all set to buy the S III have another reason as to why they should go ahead and buy it." Wireless Charging Kit for Samsung Galaxy S III !! -This is really going to give Galaxy S III users the loyalty of charging their phone wirelessly. No more tangles ! -The wireless charging kit will look somewhat like the kit displayed in the image. The phone kit is said to feature a new battery cover and a desktop cradle. -The charging kit is said to release anytime near this September 2012. -This new enhancement will take the world of mobile phones a step further. -Another phone capable with this feature is Nokia Lumia 800. Using a Touchstone Wireless Charging Dock , wireless charging can be done on the Lumia 800. -But the Lumia 800 needs to be modified by opening up the body and removing some metal from the phones case, which is a complex procedure. -We therefore wait for Samsung to get the job done by using better technology ! !